The Washington Nationals are trying to shut the book on a disappointing season, and the Atlanta Braves are making that painful endeavor even less enjoyable by their inhumane targeting of Bryce Harper and the young Washington team. This violent ordeal began on August 5th. The Braves were locked in a 2-2 battle with the Nationals in the District when Justin Upton connected on a home run to give Atlanta the go-ahead run in the eighth inning of their eventual win. Upton watched his blast for several seconds before he started his slow trot around the bases. The following night, Bryce Harper homered in the third inning and also made a slow trot, but by no means show-boated the way Upton had the previous evening. In his next at-bat, Harper was drilled by Julio Tehran, a gesture the young National clearly took offense to. Immediately, Harper mouthed off on Tehran, and both benches emptied. No punches were thrown nor ejections issued. Neither team continued the antics during the series finale on August 7th, even with Harper present in the lineup. Party over–right? Atlanta’s aggressive ship should have already sailed by the time the Nats arrived at Turner Field for a weekend series on the 16th. Harper came to the plate in the first inning to a chorus of boos from the Braves’ crowd; he promptly doubled to centerfield. If the Braves took offense to anything that Harper said or did during the next three innings, it was unclear to anyone in the media, watching on television, or in the crowd. But when he came back up in the fourth inning, he was drilled in the back on the first pitch by Alex Wood. Cheers from the Braves fans. 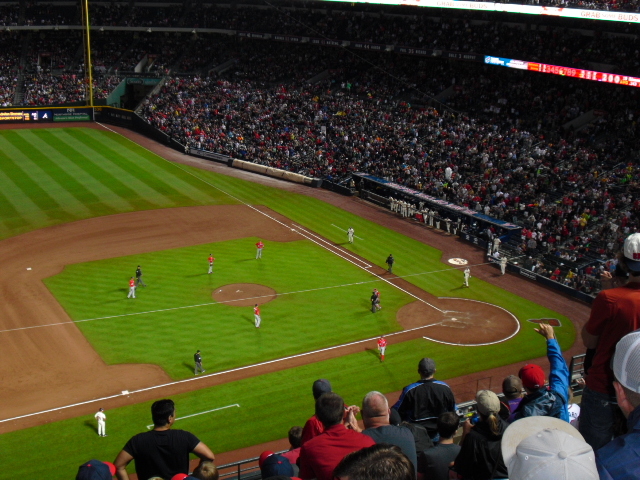 The Atlanta crowd cheers after Harper is drilled for a second time. Sometime in the middle innings, a long foul ball ricocheted off the wall into left field, where Harper was playing. Naturally, when Harper picked up the dead ball, the hundreds of fans in left field all stood and shouted at Harper to throw it up, no differently than they would have for their own fielder. However, Harper, who no doubt remembered the boo-birds that welcomed him every time his name was announced, tossed the ball from a good 100 feet in left field all the way to his team’s bullpen in the left field corner–a “game-on” gesture that had the Atlanta fans up in arms. More boos. Believe it or not, there was a game actually being played throughout all of this, and the contest went into extra innings. 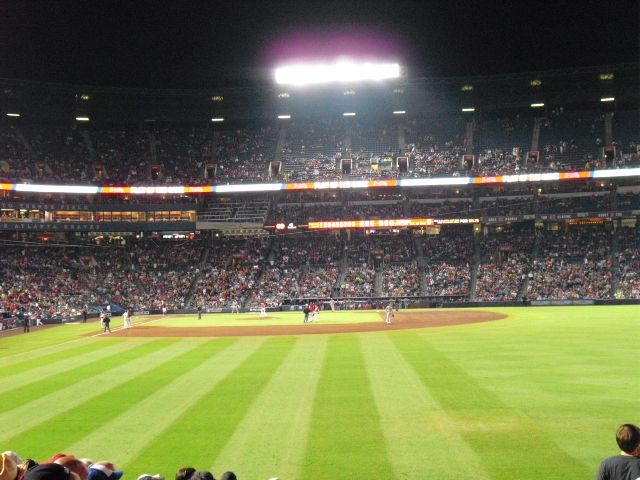 In the bottom of the 10th, Justin Upton connected on a walk-off home run to give Atlanta the 3-2 victory. Stephen Strasburg toed the rubber for Washington on Saturday night, and every follower of the insulted Nationals could smell blood. Upton strutted to the plate in the bottom of the first, and Strasburg put 97 mph in his backside. Both teams were warned as expected. For the first few innings of this game, Washington’s bullpen was empty with the exception of coach Jim Lett, a bullpen catcher, and one pitcher. Could the whole squad of relievers have been in the dugout ready for a fight? It was certainly a possibility. But then a strange inning from Strasburg abruptly halted the rapidly-escalating conflict. The Nats’ ace walked Jordan Schafer on four pitches to begin the bottom of the second. He then threw three consecutive wild pitches to Andrelton Simmons, the eight-hole hitter. The last two of the wild tosses were behind Simmons, and Strasburg was ejected after one inning of weird baseball. Strasburg is ejected after failing to hit a second batter. Was he throwing at Simmons? Hopefully, because otherwise his complete loss of control is likely indicative of some sort of injury, either physical or mental. And if he was throwing at Simmons, then why? There are seven better batters to hit in Atlanta’s potent lineup. And with a runner on base with no outs in the second inning, play some good baseball before you intentionally end your night. After Strasburg was tossed, the entire Braves dugout stood at the railing shouting across the diamond. The umpires quickly intervened to keep the teams at bay. The rest of the game, all 14 innings of it, proceeded without conflict. And the worst part of this whole ordeal? The Nationals must now stay completely on the defensive before the Braves retaliate it some way. 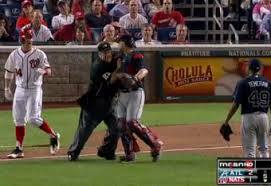 They pulled out all their stops on Saturday, and Strasburg could not even hit a second batter before being thrown out. And with a playoff appearance in the works for Atlanta, while Washington is no where near one, the Braves might as well let the Nats toss and turn at night thinking about their next move, while they themselves play clean baseball through the rest of the season. Sure, this whole affair was instigated by a Braves squad picking a fight, but the Nationals were spotlighted last night trying miserably to meet the challenge. Meanwhile, the Braves are succeeding where it matters, and taunting their only potent rival now floundering in the remnants of a bitter season.